Wild horses flee during a 2016 Bureau of Land Management helicopter roundup at the Conger Herd Management Area in Utah. Photo by Steve Paige. Interior Secretary Ryan Zinke will huddle with Rep. Chris Stewart and others at a wild horse and burro “summit” Aug. 22-24 in Salt Lake City – an event closed to the voices of wild horse advocates. The invitation-only event is far cry from the discussion about wild horses that he suggested in front of the House Interior Subcommittee. “I think we should have a roundtable and include everybody, but let’s get a plan on how to manage the population,” Zinke said at a budget hearing on June 8. Neda DeMayo, president of Return to Freedom Wild Horse Conservation, said that Zinke had created an anti-horse echo chamber, not a solution-oriented meeting. “This is absolutely not a way to find common ground,” DeMayo said. “There are readily available tools that could allow the BLM to end this costly, cruel system of helicopter roundups and off-range holding and manage wild horses in a humane, sustainable way, instead. The goal of the summit? “Full implementation of the 1971 Wild Horse and Burro Management Act”: often code for allowing BLM to euthanize “excess” wild horses, which is included in the law but which Congress has previously forbidden with protective language inserted into appropriations bills. Congress has done so with good reason – polls consistently show 80% of Americans oppose horse slaughter and similar percentages want to see wild horses protected. Stewart, R-Utah, authored an amendment to the Interior appropriations bill that would allow the Bureau of Land Management to euthanize – shoot – healthy, unadopted wild horses and burros. The House Appropriations Committee passed the amendment July 19 on a voice vote. He and others continue to peddle untrue tales of mass starvation of wild horses on the range, painting a BLM-led mass killing of wild horses and burros in government corrals and on rented pastures as somehow more humane. The Utah summit even features the emaciated silhouettes of a horse and burro as a logo. In contrast, wild horses photographed this summer appear to be quite healthy — as with these wild horses from the Winter Ridge Herd Management Area in Utah photographed earlier this month by Rob Hammer. Stewart and others are also quick to blame wild horses for range degradation without mentioning that wild horses are outnumbered 37 to 1 by cattle, even on lands set aside for wild horses. Not surprisingly, another speaker slated for the Utah summit include Keith Norris of the National Horse and Burro Rangeland Coalition, which is fueled by competing interests like the National Cattlemen’s Beef Association and American Sheep Industry Association. 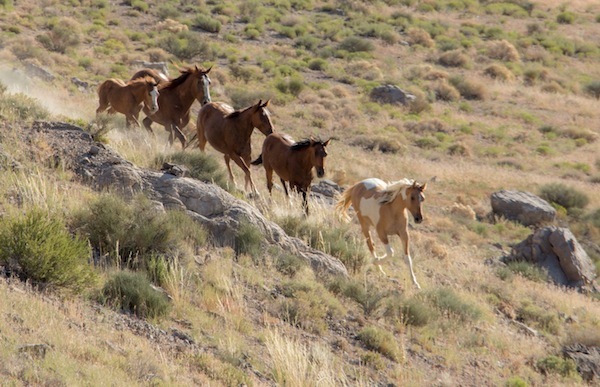 Return to Freedom has not advocated for fertility control alone, but rather as one of several steps toward achieving balanced, sustainable management of wild horses on the range. Other steps include range and water restoration projects and creating incentives for public lands ranchers who voluntarily lower their livestock numbers. Return to Freedom is planning a fall briefing on humane management alternatives in Washington, D.C.